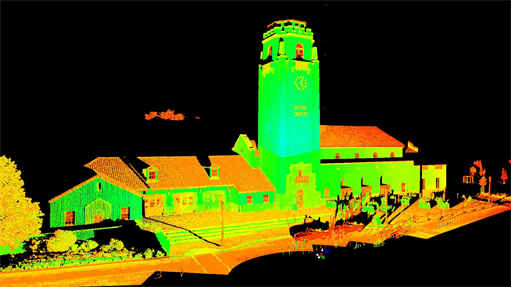 The above image is an example of a scan using our Leica HDS Scanner, and Leica Cyclone Software. With the latest technology we have the ability to acquire and utilize point clouds to create standard 2-Dimensional drawings as well as a 3-Dimensional model of your project that can be used in AutoCAD, Microstation, or other compatible CAD programs. Applicable projects include surveying and topographical mapping for Highways and Roadways, Surveying for Bridge Design and Inspection, Architectural Designs for Exterior and Interior of Buildings, Quantities Surveys, As-Built Surveys, Cell Towers, Utilities, Crime Scenes, Sewer Plants, etc. Please contact us for a presentation on the advantages that High Definition Surveying can offer for your project. With the use of our Leica HDS - High Definition Laser Scanner, Land Solutions has the ability to collect high resolution point cloud data for a variety of land surveying projects projects. Land Solutions has the capability of High Definition Surveying (HDS) within our portfolio. With the use of our Leica HDS Scanner, Land Solutions has the ability to collect high resolution point cloud data for projects. While performing a topographical survey, conventional surveying methods may collect up to 100 points per hour. But, with the advent of HDS, point data collection can be up to 50,000 points per second. This provides large amounts of data for increased accuracy and speed, and allows the ability to create 3-dimensional models of almost every project, to include topographical site surveys, roadway and highway surveys, buildings, bridges, pipeworks, utility plants, etc. High definition land surveying allows our crews to survey highway and roadway projects without having to be in traffic, or interrupt the traffic flow. With points taken as close together as 1 mm apart, the level of detail achieved with HDS is unprecedented and takes us to the next level in technological advances in surveying. Land Solutions has completed a number of projects using HDS for clients, including site topographies, pond volumes and topography, intersection topographical mapping, and bridge projects.